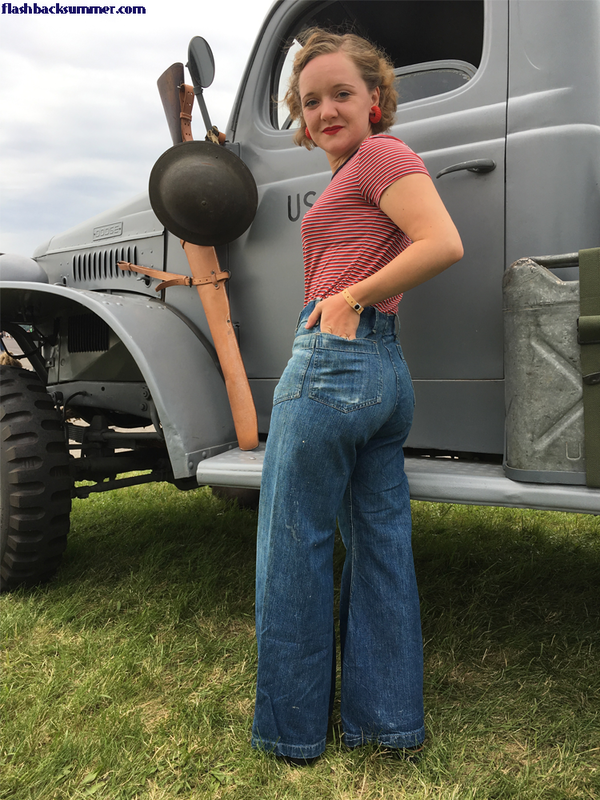 Last summer I attended my first WWII reenactment, and while I was there I got to try on these original 1940s US Navy dungarees that Emily of Emily's Vintage Visions brought to the event. Surprisingly, they fit me perfectly! They must have been owned by a very tiny, Depression-diet man back in the day as the hips and even the length fit me, a 5' tall woman. I was very intrigued at the shape of the dungarees and how they're made. 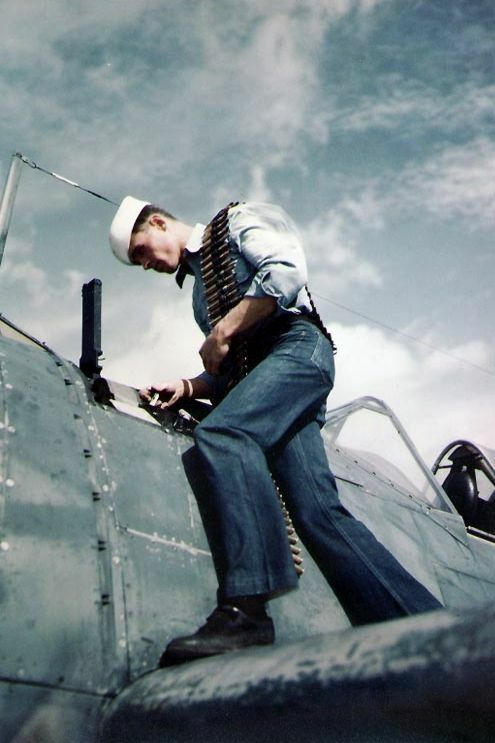 They epitomize military sewing in their efficient use of fabric and labor-saving design. They have a LOT of interesting features, and I really liked the bell-bottom silhouette. They're also super comfortable. 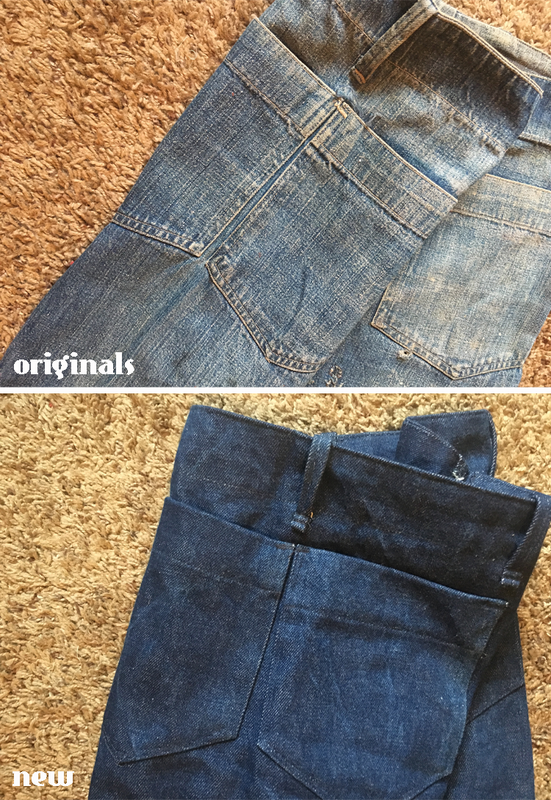 (Broken-in denim is just the best, isn't it?) I decided to try to reproduce them by making a flat pattern. I haven't done this pattern-making process a lot, but this is a really easy kind of garment to trace. It lies almost flat, and there is actually only one main pattern piece! Did you notice....? There's no side seam! Therefore, there is one big piece that makes the left side, and one big piece that makes the right side. I traced one half of these pieces on paper, then I flipped the dungarees and traced the back side. It was a wobbly tracing, but then I used a ruler to straighten things and smoothed out curves. 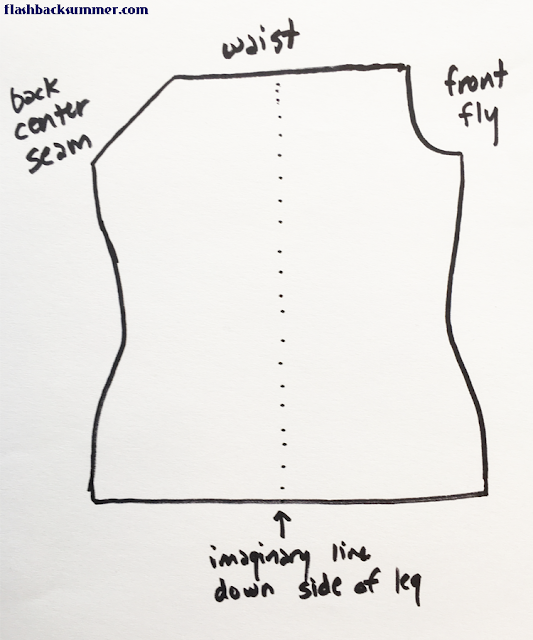 I also measured the various seams (inseam, center seams, etc.) to compare with my paper tracing and adjusted as necessary. Next, I traced the small pieces: belt loops, front and back pockets, and the front fly button placket piece. There is no waistband, only a facing, so I measured out one of those, too. 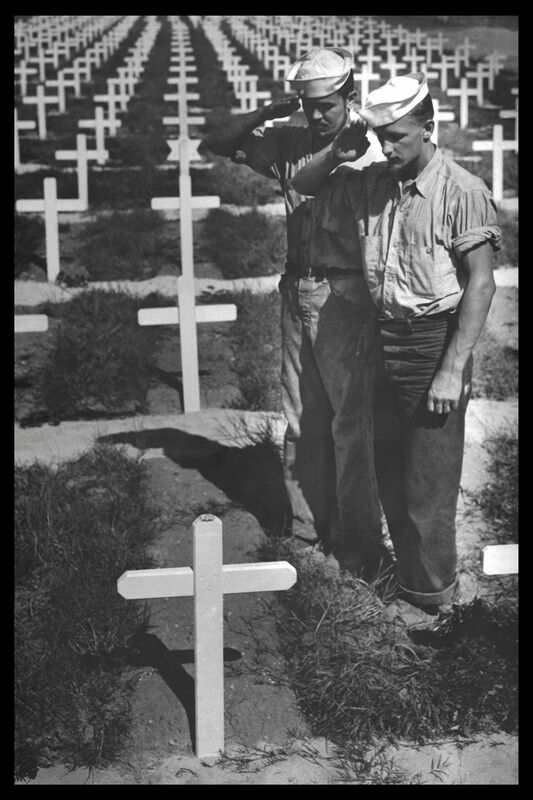 The main piece looked pretty much like this. Weird, huh? Basically... I traced, measured and hoped for the best. 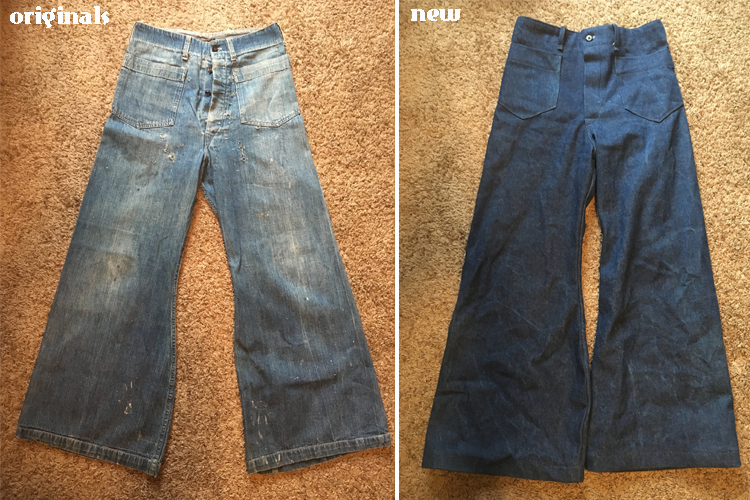 I decided to break out some random stash denim and give it a shot as a wearable muslin. I didn't adjust the pattern for myself and my measurements; I was just hoping to reproduce the fit of the original so I knew I was starting from an accurate paper pattern. It worked! The fit was pretty much spot on! 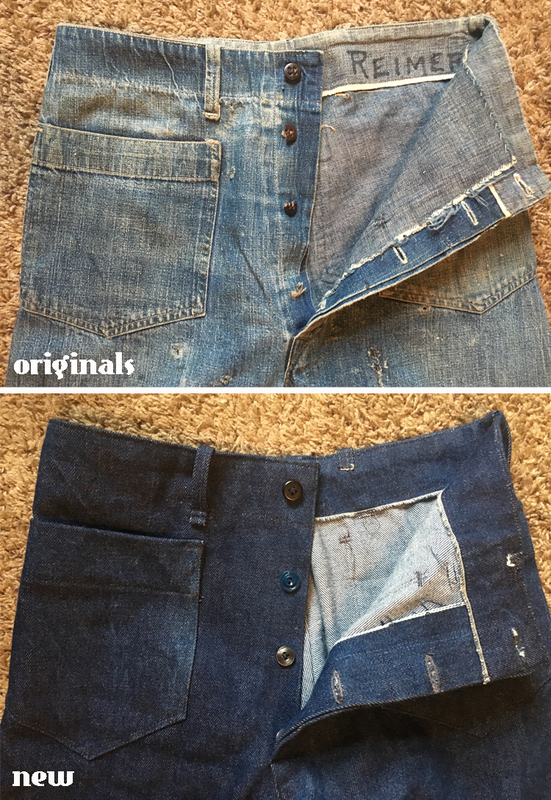 The bell bottom curve was right, I figured out the front button placket... and it fit like the originals! The only slight differences had to do with spacing between the belt loops and pockets and a the shape of the pockets themselves. They're marginally different in my version than on the 1940s pair. But I'm sure the originals, being made by humans back in the day, had similar variances because of the speedy manufacturing process and human error, so it's within my acceptable range of differences. I'd still call my version quite accurate as far as the silhouette goes (not including the fabric choice, as it's just a wearable muslin at this point). For fun, I also used mismatched buttons like the originals. They don't show because of the hidden placket feature, so who cares? 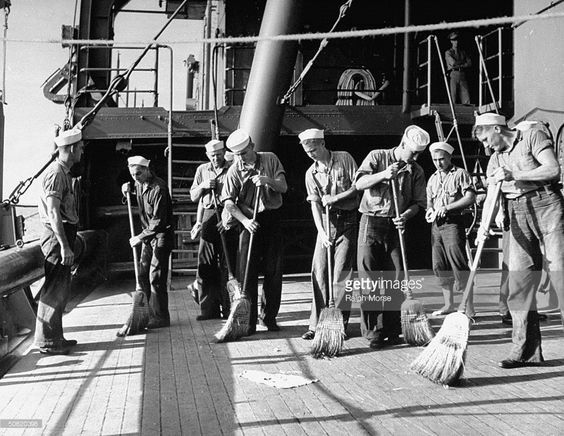 You better believe those Navy men were repairing with whatever they could find, too. All in all, I'm QUITE pleased with my starting version. They are VERY similar to the originals, and they're a fun, retro shape that I'll be incorporating into my wardrobe. 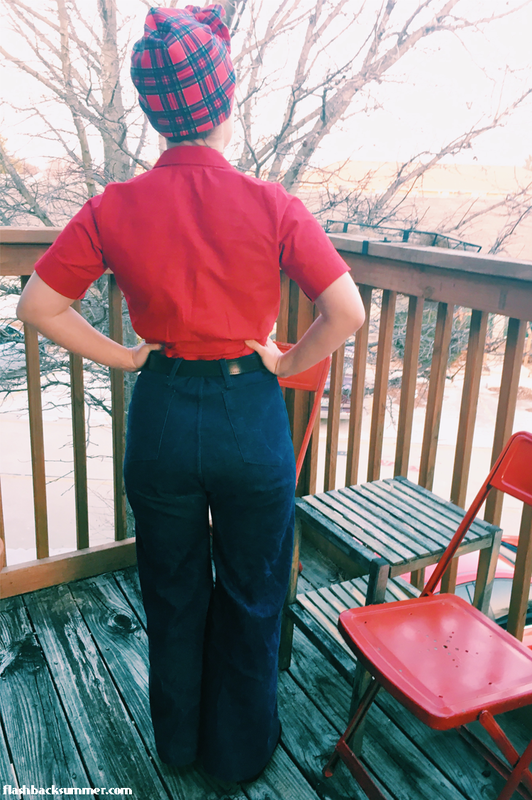 They're a fun compromise for 1930s and 40s looks, a jean that is tighter around the bum and looser at the bottom, still flattering but era-appropriate. For my next versions, I'll adjust the paper pattern to fit my more female proportions. 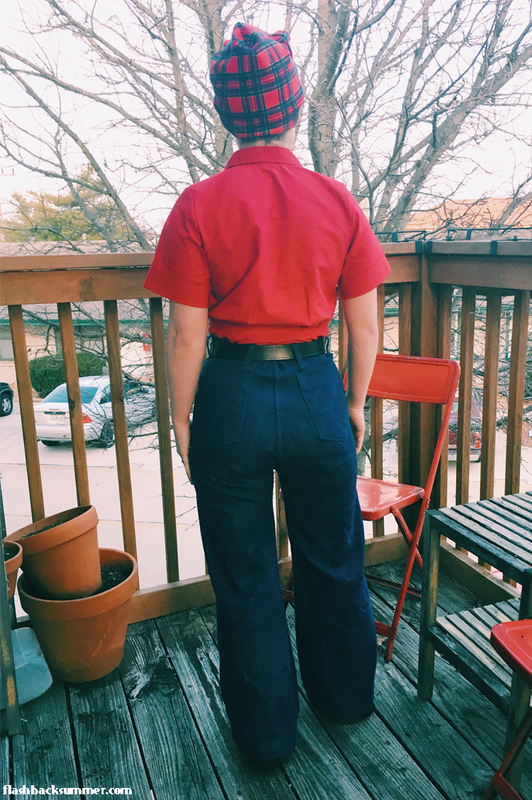 Because these trousers were originally drafted for men, I'll need to adjust for my more curvy hip-to-waist ratio (and give my rear a bit more room! ), and I may grade it up a little to make it a bit looser overall. We'll see! In case you want a similar pair for yourself, At the Front has a similar pair for sale in waist sizes 30"-48". 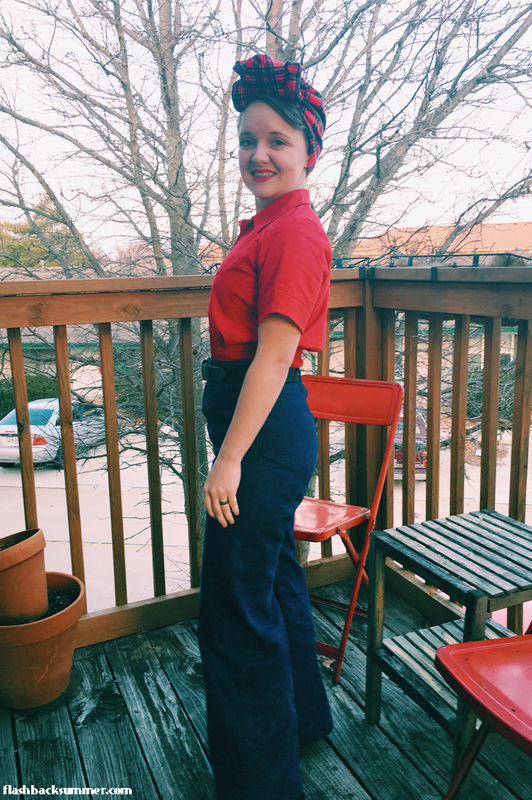 Most women need to buy a pair that fits their hips and then add darts or a belt to make the waist work, but this is still WWII appropriate as well! Pretty awesome, huh? 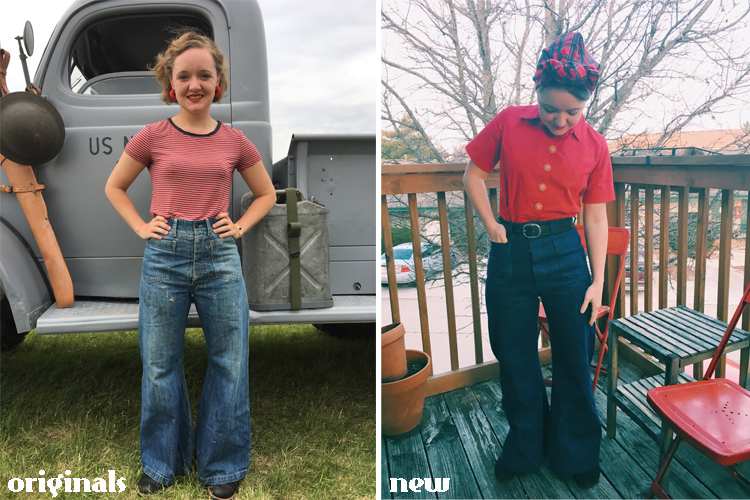 Are you guys sold on the classic Navy bellbottom shape or do you prefer the straighter-leg styles of women's 1940s trousers? 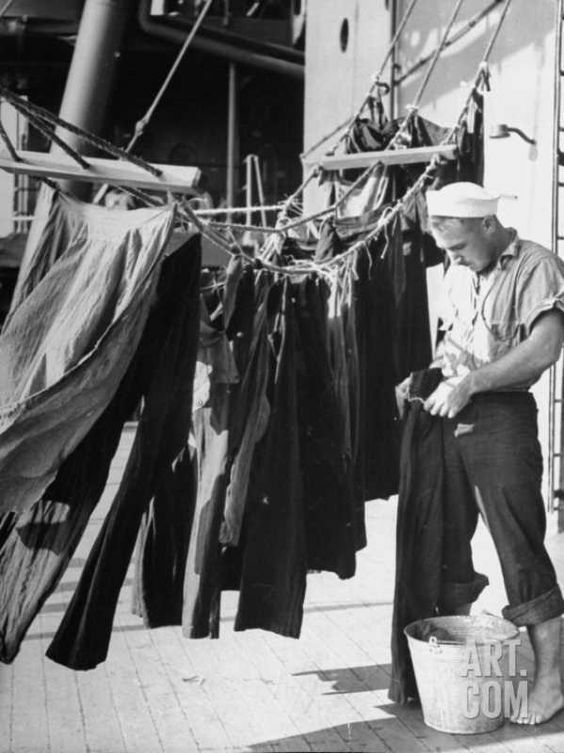 Have you ever traced a garment to make a pattern? Do you have any tips? These are lovely, Emeleigh! 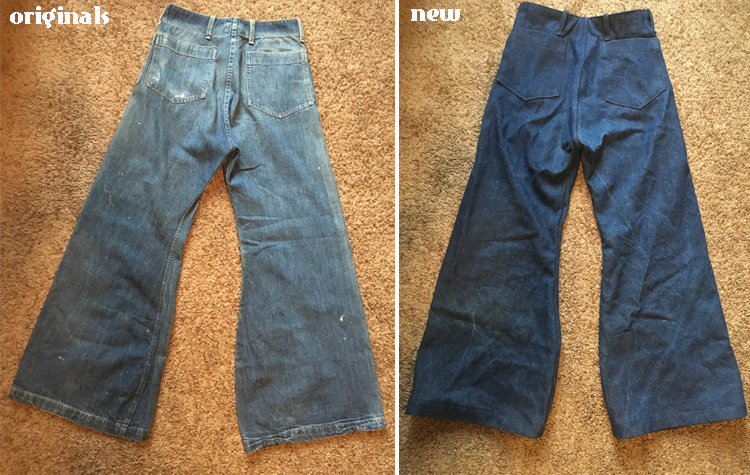 I've been wanting a pair of 40's pants for months now. 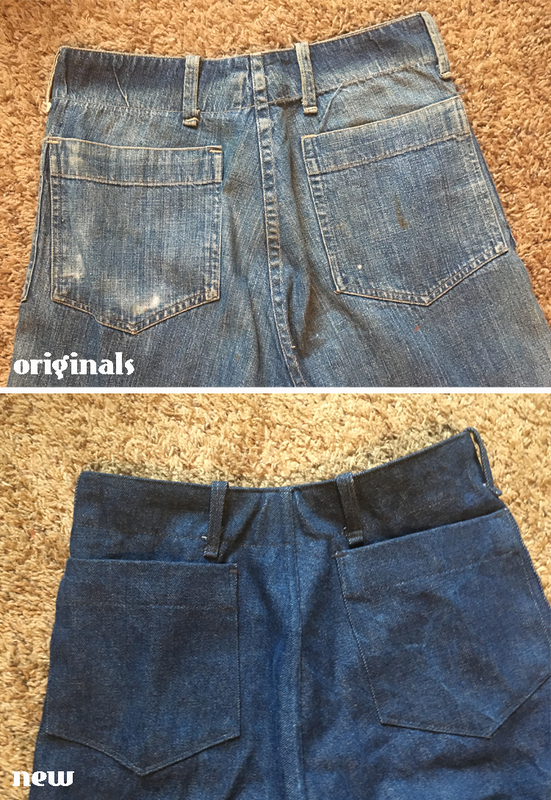 Reproduction pants can be very pricy, but I doubt I have the skills to make pants yet. You look great in yours! These look terrific! I'd love to find a pattern to make my own. I love them! Bravo on a very good pattern drafting! Gyah I love these so much. I’ll have to make a pair from my trouser block - the patch pockets & lack of side seam would make it pretty simple. It's unbelievable, I just read this post a week ago and decided I need a pair! And guess what, just yesterday I found a pattern from Anna Allen. They are just like yours but the pockets missing. I already bought the pattern and I will just add the pockets like shown with your trousers. Ha, awesome!!! Glad someone else has a similar option available!